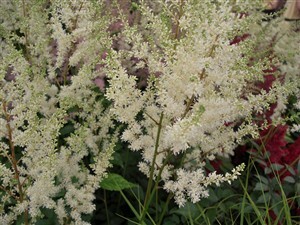 Astilbe 'Diamant' Astilbe Diamond. A large flowered form with icy sparkling white flowers graced with touches of limy green and from dark green tinged red stems. A real bright spot in a moist soil in sun or partial shade. Hardy and easy.